MADISON, Miss. (Wednesday, April 3, 2019) – St. Joseph Catholic School journalism students took 32 awards in state competition this week, including two high-profile, statewide honors and landing two members on the first All-Mississippi Journalism team. Senior Garret Grove was named Mississippi High School Journalist of the Year, and junior Joe Pearson took the prestigious Orley Hood Award for Excellence in High School Journalism. The student-produced weekly newscast Bruin News Now took first place for news and feature coverage. 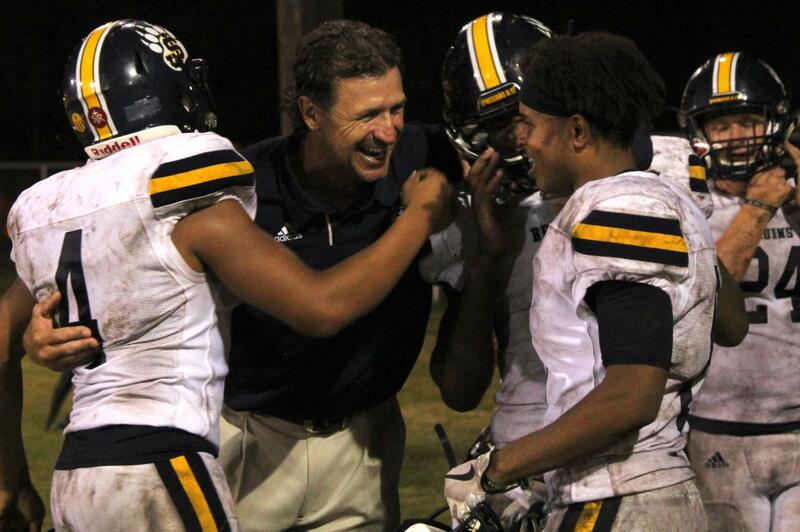 “I am so proud of our high school journalists,” said Principal Dena Kinsey. 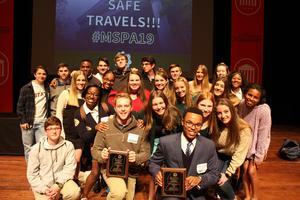 Journalism students received the awards Monday, April 1, at the end of the Mississippi Scholastic Press Association Convention on the campus of the University of Mississippi. More than 500 high school students from across the state attended the event. St. Joe offers Print Journalism and Broadcast Journalism classes, two of many electives students can take every year. Journalism students produce an online newspaper, The Bear Facts; a weekly video newscast, Bruin News Now; and an annual yearbook, The Shield. Journalism students webcast varsity football and basketball live on the Bruin News Now YouTube channel as well as broadcast an audio feed of the games over WJXC Jackson, Mississippi Catholic Radio, 107.9. Students also produce a weekly, 30-minute radio show for WJXC called The Bruin Buzz Live. A 24-member delegation of St. Joe journalism students attended the 2019 MSPA convention. There, they attended several breakout sessions covering video filming, video editing, news photography, news writing and more. The event ended with a talk by Ronnie Agnew, executive director of Mississippi Public Broadcasting, followed by the annual awards program. Grove became the second St. Joe student to be named Mississippi High School Journalist of the Year; Bruin alumnus Jack Hall received the award in 2016. Grove will advance to the national competition sponsored by the Journalism Education Association. Pearson’s win marked the fifth time in the Orley Hood Award’s six-year history that a St. Joe student received honor. Pearson also won award in 2017 and was a finalist in 2018. The award is named in memory of the late Orley Hood – a popular newspaper columnist. The Bear Facts, the school’s student newspaper, took first place for sports coverage based on the fall special edition honor the state championship swim team. Bruin News Now took first place in news coverage and feature coverage among high school newscasts. Grove took first place for a BNN news story on three St. Joe students who earned the rank of Eagle Scout; he also won first place for his BNN weekly weathercast. Junior Hannah Dear took first for a BNN feature on a memorial that honored the late Blair E. Batson. St. Joseph Catholic School journalism students celebrate the 32 awards they won at the 2019 Mississippi Scholastic Press Association Convention at the University of Mississippi, including Mississippi High School Journalist of the Year, the Orley Hood Award for Excellence in High School Sports Journalism and two members of the Inaugural All-Mississippi Journalism Team. Back row from left: John Baladi, Marshall Runnels, Byron Poindexter, Connor Dare, Ethan O’Rourke, Andrew Sanli, Jack Clements, Sydney Blake, Bianca McCarty and Leah Clark. Third row: Bailey Miller, Camillia Goodloe, Mary Kate Hamilton, Hannah Dear, Sydney Shoemaker, Harper Evers, Hayley Connerly. Second row: Kaycee Jackson, Clay Blanchard, Anna Chris Nicholas and Mary Grace Stewart. Kneeling n front: Christian Davis; Joe Pearson, winner of the Orley Hood Award for Excellence in High School Sports Journalism; and Garret Grove, the Mississippi High School Journalist of the Year. St. Joseph Catholic School journalism students won 32 awards at the 2019 Mississippi Scholastic Press Association Convention at the University of Mississippi, including Mississippi High School Journalist of the Year, the Orley Hood Award for Excellence in High School Sports Journalism and two members of the Inaugural All-Mississippi Journalism Team. 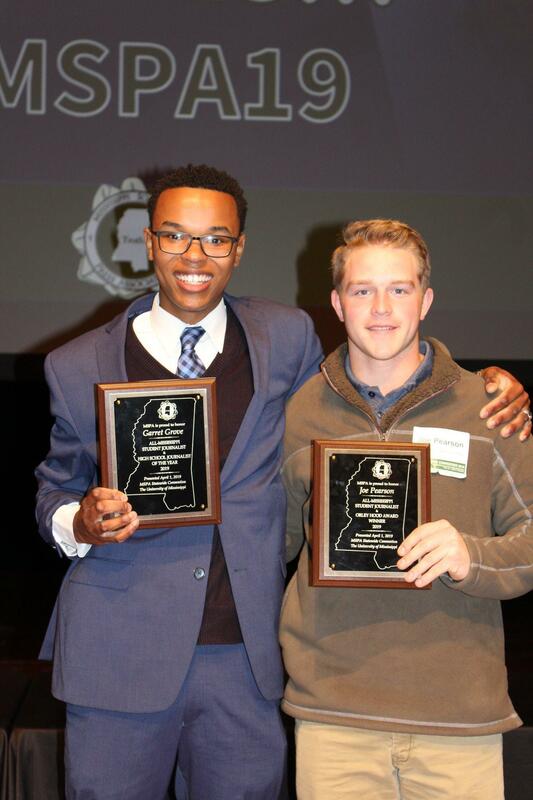 Pictured are Garret Grove, left, Mississippi High School Journalist of the Year, and Joe Pearson, winner of the Orley Hood Award for Excellence in High School Journalism. 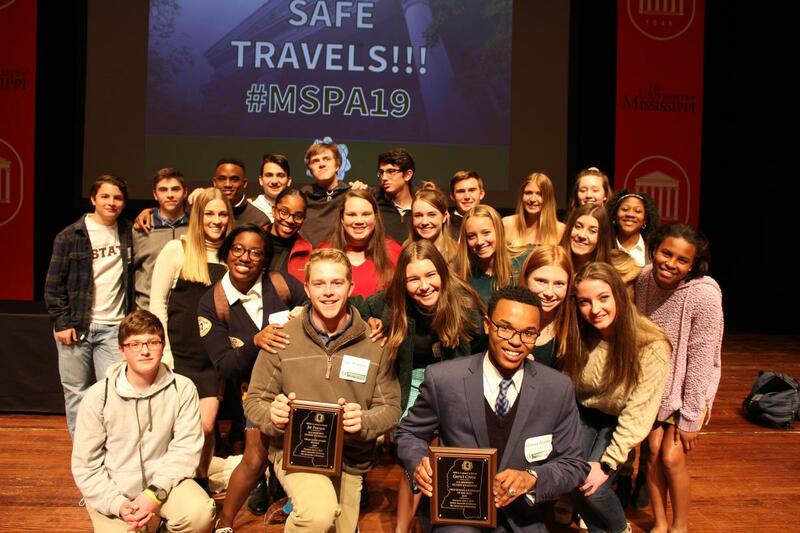 Here is a complete list of awards St. Joseph Catholic School students won at the 2019 Mississippi Scholastic Press Association Convention on Monday, April 1, 2019, at the University of Mississippi. Links to winning entries are provided if available. Winner: Joe Pearson, a junior. This was the fifth time in the award’s six-year history a St. Joe student won. Pearson won the award as a freshman in 2017 and was a finalist in 2018. Click here to view his online portfolio. These are awarded for work covering any student work published or broadcast/webcast Feb. 16, 2019, through the day of the convention on April 1, 2019. These awards are judged on the day of the convention. These are for student-produced work completed and published or broadcast/webcast during the 2018-2019 school year up to filing deadline of Friday, Feb. 15, 2019. This must be student work.